Visits to our office should be scheduled upfront. Suite # for visitations is # 280. Dallas is the third-largest city in Texas and ninth-largest city in America in terms of its population. Founded in 1841, the city of Dallas is spread across 400 square miles. It is the county seat of Dallas County as well as the business hub of North America. The city of Dallas is a perfect place to start your business or invest your money in. Dallas is an urban center that has one of the most diverse and vibrant metropolitan economies in the United States. Dallas is also famous for its transportation with a rich history of successful entrepreneurship. The Globalization and World Cities Network rank Dallas as one of the eleven “global cities” or “world cities” of the United States. Dallas is the chief economic and cultural hub of the 12-country Dallas-Fort Worth metropolitan area. With a total of 6 million people, the city is the fourth-largest city in The United States. Moreover, Dallas is one of the seven fastest growing cities in the United States since 1980. Having a diverse business climate, Dallas is widely popular for its technological industries. Some of the main types of industries in Dallas include defense, information data and technology, financial services, life sciences, telecommunications, banking, semiconductors, processing, and transportation. The Greater Dallas Chamber of Commerce reports that the Dallas-Fort Worth Metroplex comprises of 43% of the most high-tech workers in the state. The headquarters of 13 private companies are located in Dallas, which have minimum annual revenue of $1 billion. This makes Dallas the fourth largest metro area in terms of the location of corporate headquarters. Some of the Fortune 500 firms that have their headquarters in Dallas, include Advance PCS, ExxonMobil, Kimberly-Clark, Dean Foods, Neiman Marcus, Texas Instruments, and Southwest Airlines. The Dallas Independent School District in the city is the country’s eighth largest area. Furthermore, Dallas airport is the world’s second busiest airport with an accommodation of over 44 million passengers per year. The city of Dallas is one of the biggest employment places for high technology in the United States. It is also nicknamed as the “Silicon Prairie,” along with serving as a telecommunications’ manufacturing center in the nation. The Telecom Corridor in Richardson, Texas, is dedicated to telecommunication industries. This area covers a distance of three miles and is home to famous telecommunication firms like Nortel, Ericsson, Southwestern Bells, Alcatel, etc. Besides telecommunications, Dallas has a major stake in tourism and real estate industries in the United States. The city produces many goods and items, including electronic components, chemicals and similar products, machinery, parts for airline and defense industries, food items, and transportation equipment. Businesses of all kinds require translation services. Companies in Texas targeting the Hispanic markets know that products with information in Spanish perform much better than products with information only in English. Also, Texan companies operating abroad obtain great benefits by translating their content into languages such as Chinese, Spanish, German, French, Japanese, Korean, Russian and Portuguese. The cost of living in the city of Dallas is reasonable as compared to the West and East Coasts. The city does not charge any personal or corporate income tax. However, there is a sales tax of 6.25%, save for on prescription drugs and food. The housing costs in Dallas are approximately equal to the city of Atlanta, which means the average home value in Dallas is roughly $166,100. The property tax in the city is $2.93 per $100. The prime middle-class residential areas in Dallas include Richardson, North Dallas, and Plano. There are a lot of cultural and leisure attractions in Dallas. Every day there are over 100 live performances across the city. The Dallas Arts District is spread across 60 acres of land and is one of the biggest downtown arts district in the nation. 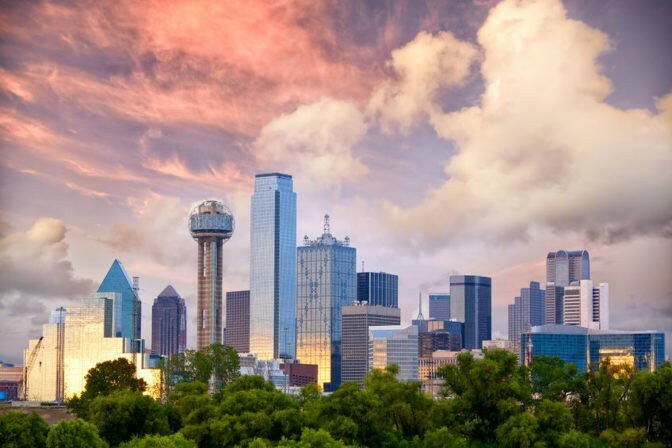 The city of Dallas has everything in terms of recreation, ranging from amusement parks, 50,000 acres of parks, and professional sports to a zoo, numerous museums, an aquarium, etc. In a recent report, Texas was ranked as the number one state in the United States for small businesses, wherein Dallas was awarded an A+ grade. This was reported by Thumbtack, which is an online project service. The report was amassed on the basis of basis of 12 chief areas, including tax, zoning, licensing, and setting up a new business.